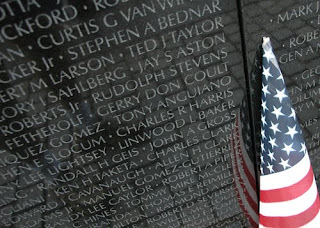 The original purpose of the Vietnam Veterans Memorial was that no one would ever forget the names of those brave men and women who gave their lives for our country. Forty percent of the visitors who visit the "Wall" are now too young to remember the war. The Education Center at the Wall has a goal to collect all 58,261 photographs of each name inscribed on the Vietnam Veterans Memorial. We need to not only remember their names, but we need to never forget their faces. 54 of our unit's 87 casualties do not have a photograph on our web site's Memorial Page. If you have a photo of one of our comrades that did not return, submit it to the Vietnam Veterans Memorial web site or send it to our troop web site and we will submit if for you. Check our Memorial Pages for the troopers who do not have photos and check your old pictures from Vietnam. If you do not have a scanner, FedEX will scan the photo for you for free and submit it. We would also like a copy for our web site. Information is available on the "Call for Photos!" web page at the Vietnam Memorial Fund web site. For our comrades we need 1 photo from 1965, 2 photos from 1966, 8 photos from 1967, 32 photos from 1968, 2 photos from 1969, and 7 photos from 1970. You can see which of our casualties we do not have photos of at our Memorial Page. Your efforts in support of this project are sincerely appreciated.